Chest physiotherapy (CPT) is a technique used to mobilize or loose secretions in the lungs and respiratory tract. This is especially helpful for patients with large amount of secretions or ineffective cough. Chest physiotherapy consists of external mechanical maneuvers, such as chest percussion, postural drainage, vibration, to augment mobilization and clearance of airway secretions, diaphragmatic breathing with pursed-lips, coughing and controlled coughing. Lungs are the main organs of the respiratory system. The lungs are located inside the upper part of our chest on either side of the heart, and they are protected by the ribcage. The breastbone (sternum) is at the center front of the chest, and the spine is at the center of the back of the chest. The inside of the chest cavity and the outside of the lungs are covered by the pleura, a slippery membrane that allows the lungs to move smoothly as they fill up with and empty out air when we inhale and exhale. Normally, there is a small amount of lubricating fluid between the two layers of the pleura. This helps the lungs glide inside the chest as they change size and shape during breathing. The trachea leads down to the thoracic cavity (chest) where it divides into the right and left "main stem" bronchi. The subdivisions of the bronchus are: primary, secondary, and tertiary divisions (first, second and third levels). In all, they divide 16 more times into even smaller bronchioles. The bronchioles lead to the respiratory zone of the lungs, which consists of respiratory bronchioles, alveolar ducts and the alveoli, the multi-lobulated sacs in which most of the gas exchange occurs. The right lung is composed of three lobes: the upper lobe, the middle lobe and the lower lobe. The left lung is made up of only two lobes: the upper lobe and the lower lobe. The lobes are divided into smaller divisions called segments. The upper lobes on the left and right sides are each made up of three segments: apical, posterior and anterior. The left upper lobe includes the lingual, which corresponds to the middle lobe on the right. The lower lobes each include four segments: superior, anterior, basal, lateral basal and posterior basal. Each segment of the lung contains a network of air tubes, air sacs and blood vessels. These sacs allow for the exchange of oxygen and carbon dioxide between the blood and air. It is these segments that are being drained. Inhalation is initiated by the diaphragm and supported by the external intercostal muscles. Normal resting respirations are 10 to 18 breaths per minute. Its time period is 2 seconds. Inhalation is primarily driven by the diaphragm and accessory muscles. When the diaphragm contracts, the ribcage expands and the contents of the abdomen are moved downward. This results in a larger thoracic volume, which in turn causes a decrease in intrathoracic pressure. The major function of the respiratory system is gas exchange. Upon inhalation, gas exchange occurs at the alveoli, the tiny sacs which are the basic functional component of the lungs. The alveolar walls are extremely thin, and are permeable to gases. The alveoli are lined with pulmonary capillaries, the walls of which are also thin enough to permit gas exchange. All gases diffuse from the alveolar air to the blood in the pulmonary capillaries, as carbon dioxide diffuses in the opposite direction, from capillary blood to alveolar air. Now, the pulmonary blood is oxygen-rich, and the lungs are holding carbon dioxide. Exhalation follows, thereby ridding the body of the carbon dioxide and completing the cycle of respiration. In an average resting adult, the lungs take up about 250ml of oxygen every minute while excreting about 200ml of carbon dioxide. During an average breath, an adult will exchange from 500 ml to 700 ml of air. This, average breath capacity is called tidal volume. Pneumonias in dependent lung regions. Know the normal range of patient’s vital signs. Conditions requiring CPT, such atelectasis, and pneumonia, affects vital signs. Know the patient’s medications. 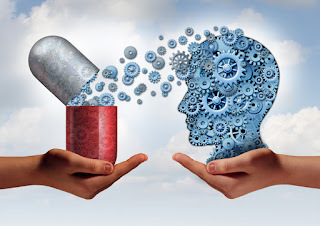 Certain medications, particularly diuretics antihypertensive cause fluid and haemodynamic changes. These decrease patient’s tolerance to positional changes and postural drainage. Know the patient’s medical history; certain conditions such as increased ICP, spinal cord injuries and abdominal aneurysm resection, contra indicate the positional change to postural drainage. Thoracic trauma and chest surgeries also contraindicate percussion and vibration. Know the patient’s cognitive level of functioning. Participating in controlled cough techniques requires the patient to follow instructions. Beware of patient’s exercise tolerance. CPT maneuvers are fatiguing. Gradual increase in activity and through CPT, patient tolerance to the procedure improves. A nurse or respiratory therapist may administer CPT, although the techniques can often be taught to family members of patients. 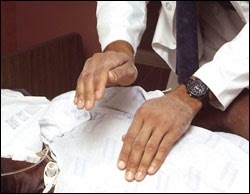 The most common procedures used are postural drainage and chest percussion, in which the patient is rotated to facilitate drainage of secretions from a specific lobe or segment while being clapped with cupped hands to loosen and mobilize retained secretions that can then be expectorated or drained. The procedure is somewhat uncomfortable and tiring for the patient. Chest percussion involves striking the chest wall over the area being drained. Percussing lung areas involves the use of cupped palm to loosen pulmonary secretions so that hey can be expectorated with ease. Percussing with the hand held in a rigid dome-shaped position, the area over the lung lobes to be drained in struck in rhythmic pattern. Usually the patient will be positioned in supine or prone and should not experience any pain. Cupping is never done on bare skin or performed over surgical incisions, below the ribs, or over the spine or breasts because of the danger o tissue damage. Typically, each area is percussed for 30 to 6oseconds several times a day. If the patient has tenacious secretions, the area must be percussed for 3-5 minutes several times per day. Patients may learn how to percuss the anterior chest as well. In vibration, the nurse uses rhythmic contractions and relaxations is or her arm and shoulder muscles while holding thee patient flat on the patient’s chest as the patient exhales. The purpose is to help loosen respiratory secretions so that they can be expectorated with ease. Vibration (at a rate of 200 per minute) can be done for several times a day. To avoid patient causing discomfort, vibration is never done over the patient’s breasts, spine, sternum, and rib cage. Vibration can also be taught to family members or accomplished with mechanical device. Instruct the patient to inhale slowly and deeply. Vibrate the chest wall as the patient exhales slowly through the pursed lips. Place one hand on top of the other affected over area or place one hand place one and on each side of the rib cage. Relieve pressure on the thorax as the patient inhales. Encourage the patient cough, using abdominal muscles, after three or four vibrations. Repeat the percussion and vibration cycle according to the patient’s tolerance and clinical response: usually 15-30 minutes. Postural drainage is the positioning techniques that drain secretions from specific segments of the lugs and bronchi into the trachea. Because some patients do not require postural drainage for all lung segments, the procedure must be based on the clinical findings. In postural drainage, the person is tilted or propped at an angle to help drain secretions from the lungs. Also, the chest or back may be clapped with a cupped hand to help loosen secretions—the technique called chest percussion. Postural drainage also cannot be used for people who are unable to produce any secretions (because when this happens, further attempts at postural drainage may lower the level of oxygen in the blood). The patient's body is positioned so that the trachea is inclined downward and below the affected chest area. Postural drainage is essential in treating bronchiectasis and patients must receive physiotherapy to learn to tip themselves into a position in which the lobe to be drained is uppermost at least three times daily for 10-20 minutes. The treatment is often used in conjunction with the technique for loosening secretions in the chest cavity called chest percussion. Use specific positions so the force of gravity can assist in the removal of bronchial secretions from affected lung segments to central airways by means of coughing and suctioning. The patient is positioned so that the diseased area is in a near vertical position, and gravity is used to assist the drainage of specific segment. The procedure should be discontinued if tachycardia, palpitations, dyspnea, or chest occurs. The se symptoms may indicate hypoxemia. Discontinue if hemoptysis occurs. Encourage the patient to deep breathe and cough after spending the allotted time in each position. Bilateral-Apical segments Sitting on nurse’s lap, leaning slightly forward flexed over pillow. Bilateral- anterior segments Lying supine on nurse’s lap, back supported with pillow. coughing gently or making short grunting noises with the mouth slightly open will help loosen the mucus. Do this periodically throughout the drainage procedure. Controlled coughing is one of the essential techniques in good respiratory care. Patient perform this maneuver after each drainage position and often throughout the day. The abdominal muscles are very powerful muscles used in coughing and exhaling. Inhale deeply through the nose. Cough 2 to 3 sharp staccato cough with proper hand/arm placement. Breathe in easily through the nose. Chest physiotherapy is an effective procedure in chronic pulmonary disorders. This is especially helpful for patients with large amount of secretions or ineffective cough. It is performed by professionally trained nurses in most settings. Potter Perry. Basic Nursing 6th edn..Mosbi, Missouri, 2006. Judson, MA, Sahn, SA (1994) Mobilization of secretions in ICU patients. Respir Care 39,213-226. Wallis C., Prasad A. Who needs CPT? Moving from anecdote to evidence. Arch Dis Child 1999; 80:393-397. Fedorovich C; Littleton MT. Chest physiotherapy: evaluating the effectiveness. Dimensions of Critical Care Nursing (DCCN), 1990 Mar-Apr; 9(2): 68-74.